The Beach Cabarita Tweed Coast accommodation offers you the perfect location for your next holiday. Enjoy truly luxurious accommodation and guest facilities that sit centrally in between the Gold Coast and Byron Bay, two of the most popular tourist destinations.. For couples, friends, and families Cabarita Beach Resort has everything provided for the ultimate unforgettable holiday. Our 2 Bedroom Apartments give you 2 bedrooms and 2 bathrooms ready to accommodate up to 5 guests, whilst our 3 Bedroom Apartments also feature 2 bathrooms but will accommodate up to 7 guests comfortably, perfect for bigger families and groups. At The Beach Cabarita Resort we also offer a 3 Bedroom Sky Apartment, which is a more affordable option but still spacious and offering all the comforts of home with a lovely outlook to the sea and the mountains to the west. Then there is the 3 Bedroom Penthouse which sits on the top floor of the complex with stunning views North, South and East.. This spacious luxury apartment also offers its own private roof top swimming pool and sun deck with BBQ facilities. A simply spectacular space to spend time with family and friends. No matter what your needs The Beach has such varied accommodation options they are sure to have the perfect apartment for you. You can also enjoy our fantastic facilities. 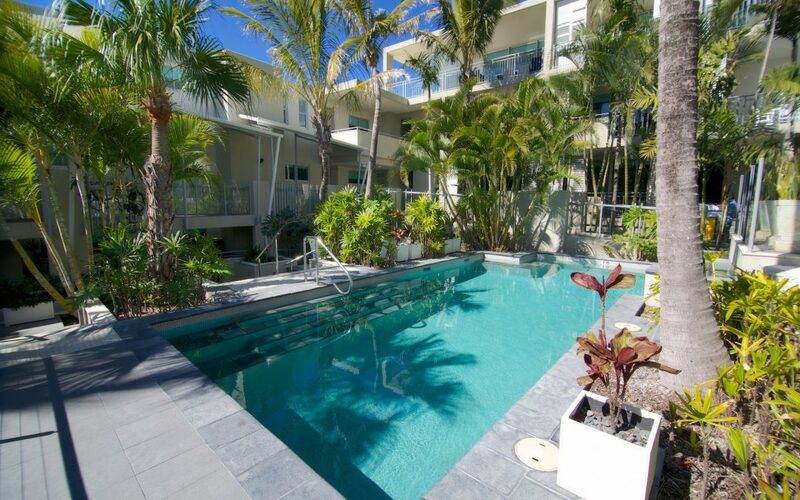 Set in beautiful landscaped gardens The Beach Cabarita Resort offers 3 outdoor swimming pools. Throughout your holiday the whole family can enjoy choosing from our heated pool, unheated pool, and children’s wading pool. The perfect way to relax! The relaxation continues with our resort spa and in-room massages or beauty treatment. Enjoy The Beach Bar and Grill whenever you please, our onsite restaurant and bar.Open for both lunch and dinner 7 days and nights a week, The Beach Bar offers modern Australian Cuisine in a relaxed and friendly atmosphere where families can watch the children play together on the front lawn or in the children’s play room.We also have a resort fitness room so you can stay fit during your holiday.